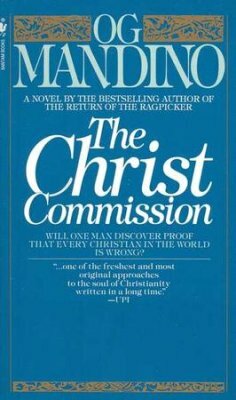 The Good Shepherd Episcopal Church Women (ECW) Book Club will discuss The Christ Commission: Will One Man Discover Proof That Every Christian in the World Is Wrong? by Og Mandino in May. All women at Good Shepherd are encouraged to drop by and participate in the discussion. No need to RSVP. No need to read the book. Come join us! In front of eight million TV viewers, "The Greatest Mystery Writer in the World" bragged he could prove Christ was actually stolen from the tomb and never really rose from the dead . . . if he were given just one week back in ancient Jerusalem. That night author Matt Lawrence got his wish. A knock-out punch took him right out of this world and landed him in Biblical Judea in 26 A.D., just six years after the execution of Jesus at Golgotha. In relentless pursuit of his investigation, Lawrence walked the same streets Jesus walked, visited the same places . . . and found himself facing the same dangers. Eyewitness reports might lead him to a discovery that would shake the world--but will he live long enough to tell the 20th century that he just solved the greatest mystery of all time? Will his interviews & experiences prove his current belief - that it was all a hoax to perpetuate the Christian religion, or will he be provided with the amazing proof necessary to change his beliefs? This book is about the journey of Mr. Lawrence - a well-known mystery/fiction writer who, during a stint on the Johnny Carson Show, shares with the public that he regretted that he was never able to finish the first book he ever started, a book he would have titled "The Christ Commission". It was to be a mystery book about the Resurrection of Christ - where a "Christ Commission" would be the "detectives" who would prove once and for all that this event really did take place. Copies of The Christ Commission are available for sale in the parish hall or can be ordered from Amazon. Contact Yvonne Danford at 608-7653(c), 936-4453(w) or email to YvonneDanford@scfbins.com for more information.